Now that the colder weather’s drawing in, people’s minds start to let go of the idea of lazing in the garden with an ice cold G&T and turn instead to wrapping up and indulging in more wintry pursuits, and this includes winter extreme sports! 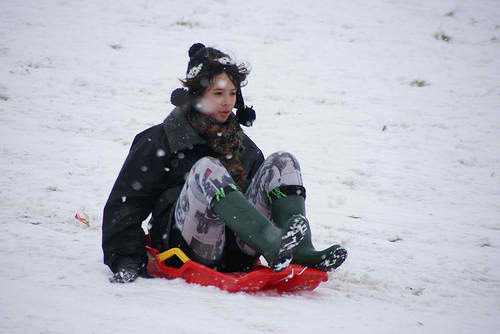 Whatever your current passion is, you can’t deny the alluring pull of hurtling down a hill on a toboggan! 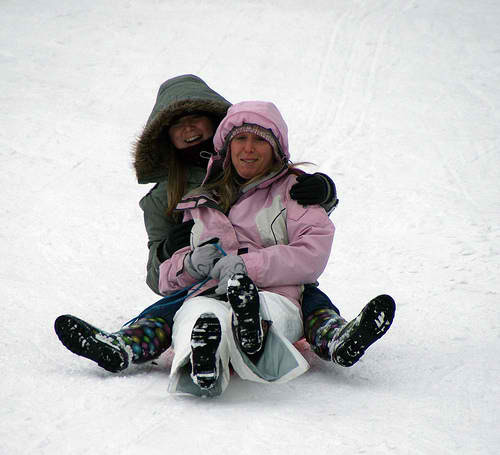 Most people enjoyed a spot of tobogganing in their childhood but the enjoyment needn’t end now we’re grown up! That’s why we’ve put together a list of the top ten sleds and toboggans that are currently on the market. You might be buying for your favourite little nipper this Christmas or perhaps you’ve decided that this is the year you’ll get back into sledding. Whatever your reasons, you’re bound to find the perfect model here in our list of the best toboggans available. If you’re looking for something conventional, this model is a cracking option. 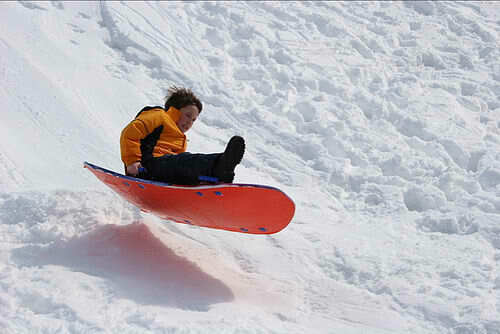 The design is based on a popular and traditional model of toboggan and as such is sturdy and well made. The wood is high quality beech and there are PVC end caps, as well as steel glides on the base for a smooth and speedy ride. 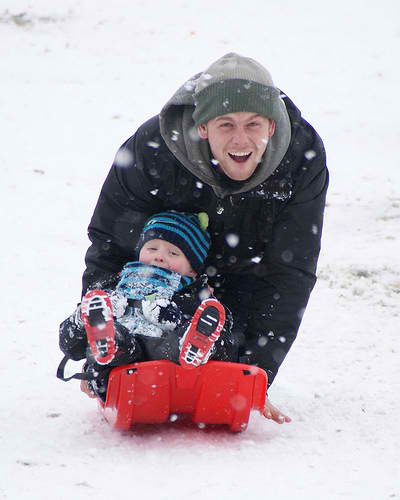 The small model of the Tracker Wooden Snow Sled is currently listed on Amazon for just $99.00. Every top ten needs a serious budget item and this is it: listed at just $17 on Amazon, this Paricon Winter Heat toboggan won’t even come close to breaking the bank. It is made entirely of recycled materials too so your conscience can take a breather as well. Tilt your body to steer the sled and hang on to the side handles to stay put. Designed for one, this hard-wearing model will keep you sledding for winters to come. Also from Paricon is this diddly equivalent for thrillseeking toddlers. Priced at just $10 on Amazon, this sled is designed for budding sledders and has high sides to keep your precious load inside the toboggan. It’s also fitted with a child safety strap and can be pulled from the front. Suitable for ages 18 months to 4 years, your toddler will absolutely love unwrapping this at Christmas! At the pricier end of the scale, this offering from Mountain Boy Sledworks is currently priced at $159.99 on Amazon. But goodness does it look the part with its front curl under which you can tuck your legs. The sled is hand made with tremendous care from flexible basswood and hand-carved crosspieces. This particular model is designed for ages 3 and up but comes in a variety of sizes (prices may vary) to accommodate bigger children (or ‘adults’ if you prefer…). Right around the middle of the price scale at $59.95 (Amazon), the Ice Meister seems to receive blanket rave reviews. Not only can it tackle icy and snowy slopes, this sled is quite happy on grass too for year-round fun. The hollow, double-walled construction absorbs the bumps of sledding and cushions riders of weights up to 200lbs. If you’re looking for something a little bigger, this model from Pelican is a slender design that can take up to three riders. A modern slant on the traditional toboggans out there, this bad boy is thermo-formed and has 6 moulded hand grips for riders to hang onto. Suitable for ages 6 and up, your little ones will love getting out and about with their siblings or friends and tackling the local hills in their new toy! Prices vary from $33 upwards on Amazon. To avoid the grandkids squabbling over who gets the next go, why not pick up this super 3 pack from Paricon? Priced at $36.33 (Amazon), these sleds are made from highly durable, slick coated plastic and for the price, are surprisingly sturdy. They’re super-fast and super-robust, try them out for yourself! Suitable for ages 3 and up. Now it might look very simple for the price (currently listed at $41.99 on Amazon) but this extremely popular model is getting rave reviews. Big enough to fit up to four small children, these sleds come in bright colours so that they can be easily spotted by watchful parents from a distance. It goes pretty darn fast but it tracks nice and straight so you can’t go too wrong! Now this is our personal favorite for sheer innovation. With prices starting at $31.99, these babies are truly fantastic amounts of fun. Available in a fab array of colours, they have rails on the base and a lever on the top for clinging on to which gives the sled a really unique look. Your kids will absolutely love these but they’ll have to let you have a goo as well. You’ll feel like a kid again yourself! This one’s the winner if you’re looking to score cool points. The design of the Flexible Flyer is incredibly eye-catching and it’s constructed out of lightweight foam to ensure maximum speed. There are two sets of sturdy handles so your little one can take a pillion rider, and their friends will be queuing up round the block for their turn. Priced at $35.81 on Amazon, your money will be well spent. Whether you want traditional beech, modern plastic or lightweight foam, there really is something for everyone in the sledding world. And with such a huge range of prices, your family could be enjoying some of the best toboggans available for very little investment. So get clicking and order your sled today. You could be shooting down the slopes within a week! This entry was posted in Reviews, Tobogganing, Winter Sports and tagged Sledding, Sleds, Tobogganing, Toboggans, Top 10. Bookmark the permalink.